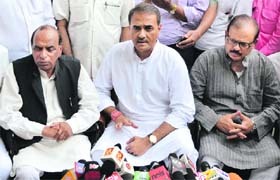 Estranged UPA ally NCP today deferred a decision to pull out of the government, signalling that back-channels efforts in the Congress are working overtime to arrive at a settlement with its partner. However, the NCP kept up the pressure on the government as party chief Sharad Pawar and his deputy Praful Patel skipped the dinner hosted by Prime Minister Manmohan Singh on Monday evening for outgoing President Pratibha Patil. After cutting prices by almost Rs 2.50 a litre last month, oil companies today raised petrol prices by at least 70 paise a litre (excluding state levies) from midnight tonight. With the hike, the increase in selling price of petrol will vary from 70 to 91 paise per litre, including state levies depending upon the taxes in different states. As Rewari finds itself engulfed in the rage and rancour over Haryana government's land acquisition policy, the farmers in the two villages of neighbouring Mahendergarh appear ready to fight yet another battle to "avenge betrayal". 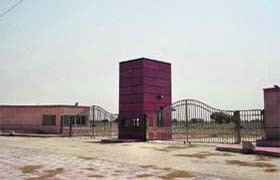 The main gate of the university in Mahendergarh district near Rewari. The Haryana Government today appointed criminal lawyer KTS Tulsi as special prosecutor for the trial of those involved in violence at Maruti Suzuki's Manesar plant on July 18 that claimed the life of one senior company executive. More than seven years after 37 persons were killed in a train accident on the Jalandhar-Pathankot rail section in Punjab, their kin are set to get jobs promised by former Railway Minister Lalu Prasad Yadav. The Railways had all but forgotten the announcement made by Lalu in December 2004. In May this year, it even disowned it. The Supreme Court today rejected the government�s proposal for a discretionary quota of 11,000 Haj pilgrims, slashing such allocations to 500. A Bench of Justices Aftab Alam and Ranjana Desai fixed the discretionary quota for the President at 100, the Vice-President and the Prime Minister at 75 and the External Affairs Minister at 50. The US today virtually offered to match India�s 50-year-old ally Russia in matters of multi-billion dollar defence deals. It has offered high-end technology, latest equipment and even a promise to change its stringent technology-transfer rules to accommodate New Delhi�s growing ambitions.